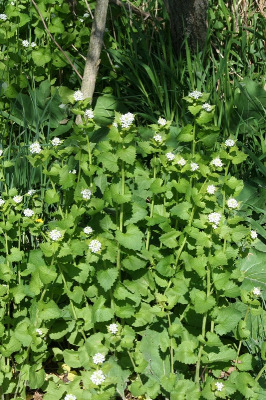 A native of Europe and Asia, naturalized locally in North America, but often abundant where found, in disturbed ground, such as roadsides, and in moist forests, even swamps. Now a serious pest of forest understories in some areas. 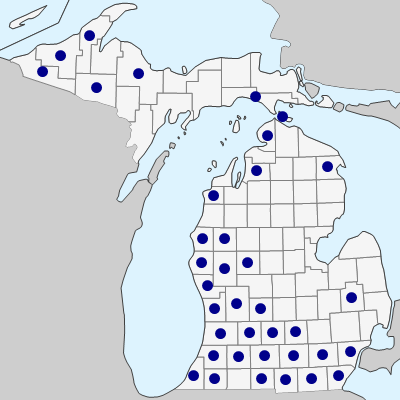 The spread of this species has been recent; the first collection was in 1956 in Kent Co. The Allium-like odor of the bruised plant is unusual in a family where the odor, if any, is normally of a turnip, cabbage, or horseradish nature. Alliaria is also distinctive in its slenderly petioled leaves with broad ± triangular, often cordate blades. The white petals are ca. 4–7 mm long and the fruit is a slender silique on a pedicel nearly as thick. It is a biennial, with ± evergreen basal rosettes whose leaves are more rounded than the stem leaves. MICHIGAN FLORA ONLINE. A. A. Reznicek, E. G. Voss, & B. S. Walters. February 2011. University of Michigan. Web. April 21, 2019. https://michiganflora.net/species.aspx?id=598.